Another weekend, another race. 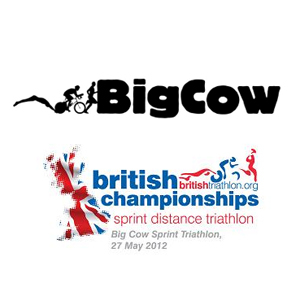 Following on from last week’s Olympic Distance race, I moved down to a sprint race with this one being the National Sprint Championships which was being held at Emberton Park, Milton Keynes & hosted by Big Cow. As we were unable to stay in our usual B&B we were hoping that the new accommodation would be as good as we expected. We were very pleasantly surprised to find that it was lovely, with a massive en-suite bathroom with a shower big enough to fit in half a football team in it!!! So after unpacking, I headed off to do my usual 20min ride / 10min run then we both headed off to Emberton Park to register, check out the lake & the transition area ins & outs. Having done this, we then headed back to our hotel for dinner. A 5am alarm call woke us to what looked like the start of another sunny day, but I thought that triathlon was supposed to be a summer sport because when we got to the car, we found that it was covered in thick ice & the temperature being just above freezing. This got me thinking that this was going to be another cold swim!! We arrived at Emberton Park to find that the lake was shrouded in a thick mist. There was a lot of hustle & bustle in & around transition, which I enjoy. Luckily I had a transition slot right at the end of the racks. I again checked the ins & outs for swim, bike & run & did a warm up run. I was in the 4th out of 5 waves & in the lake at 8:30am & by this time the sun had burnt off the mist & the race started dead on time at 8am. I found that surprisingly, when I entered the water, it was bath-like compared to what I had experienced last week. The swim was a one lap 750mtr swim so I decided to hug the bank towards the first buoy which worked quite well. I had no untoward problems in the swim. After exiting the lake T1 went well & quite smooth. Then out onto the 20K one lap bike route. Again we had reccied the route on Saturday evening. There were four cheeky little climbs & one big climb towards the end, with a quick descent into transition. I had to put gloves at the start of the bike (I had already put the arm warmers on under my wetsuit) as even with the sun out, it wasn’t that warm. As per normal, the uber-bikers came flying past me after about 4 miles but I just concentrated with my own thing. The only annoying part of the ride was that the quick descent back to the Park was ruined by a Morrisons artic because as the lorry was unable to overtake the cyclists in front of me, it was backing up the cars which was slowing me down (very annoying indeed). Finally into T2 for a reasonable transition, but I did have a little issue with putting my shoes on as my toes were still very cold, even with toe warmers on!!! A 5K, two lap run around the outskirts of Emberton Park lake was a little bit uncomfortable on the feet because they were still so cold, but I felt that I was running OK. Yes, I was getting overtaken a few times but wasn’t quite sure whether they were in my age group or what lap they were on. Thank you Coach 2 for your support.